The European war became a laboratory for all the suffering of the century, from the extermination of the Armenians to the refugee crisis, the internments, and the unending modernization of warfare...What is most remembered about the war is the mass slaughter of combatants—over 10 million dead in four and a half years. Unlike in previous wars, very few died of disease; almost all were killed in the fighting. The survivors did not fare much better. Nearly 50 percent of all those who fought were wounded, whether seriously or not, and often more than once. Shells were the main cause; poison gas, though a new terror, caused far fewer casualties. All at once everything breaks, cracks, booms. General commotion. A thousand blasts. Infernos, fires, explosions. It’s an avalanche of cannon. The thunder rolls. Barricades. The firing pin. In light of the looming departure, oblique, ambiguous men, the index of a signboard, a crazy horse. The batting of an eyelid. The flash of magnesium. A quick snapshot. Everything disappears. [H]e was blown up by a shell and I saw, with my own eyes I saw, this handsome legionary sucked up into the air, violated, crumpled, blasted in mid-air by an invisible ghoul in a yellow cloud, and his blood-stained trousers fall to the ground empty, while the frightful scream of pain emitted by the murdered man rang out louder than the explosion of the shell itself, and I heard it ringing still for a long moment after the [vaporized] body had ceased to exist. It was because there was so often no identifiable trace of killed men that governments started to commemorate the Unknown Soldier. Are the quotes all from Blaise Cendrars? I need to read this, then! 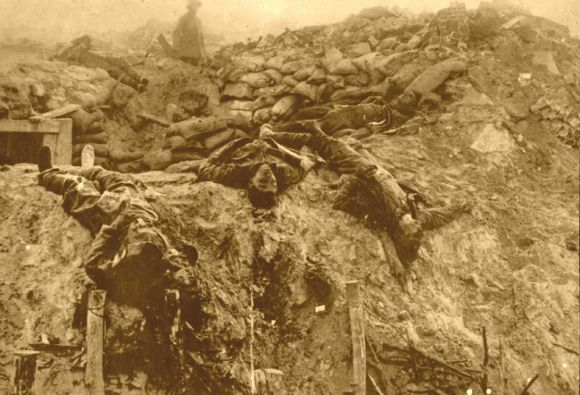 The carnage of WW I on combatants was stunning...enough that many wanted this to be "the war to end all wars." The attrition warfare of the trenches, which turned into a stalemate for four years for British, French and German forces on the western front was blood-letting at unacceptable levels for these belligerents. They were almost bled white, by the time 2 million fresh American forces arrived to do combat in the Spring-Fall 1918, helping turning the tide of the war for the Allies. Unfortunately, late in the war, in 1918, disease and pestilence made its entrance on the battlefield and on the home front in many countries in such a manner that it soon dwarfed already staggering combat casualties that made the WW I era world-wide one of the most devastating of our conflicts. The American combat experience was also harsh, but was trumped by disease, which killed 58,000 U.S. troops (80% of them died of the flu pandemic of 1918)compared to American combat deaths of 53,000.
an estimated 50 million died of the Great Flu Pandemic of 1918 during WW I, five (5) times the 10 million combat casualties of the war. Worldwide this pandemic was a public health disaster, with the near equivalencies to the Black Death, concurrently happening along with staggering combat losses during WW I, giving us a death toll that has few parallels in history. This disease statistic is often left out of WW I narratives of combat and politics of The Great War, as recently reported in an article in the Military Officers Association of America (MOAA) "Military Officer" magazine's October 22, 2018 edition (see: http://www.moaa.org/Content/Publications-and-Media/News-Articles/2018-News-Articles/How-the-Military-Played-a-Vital-Role-Against-the-Attack-of-the-Spanish-Influenza.aspx ). For those interested in the disease story of WW I, Dr. Carol Byerly, as a historical research specialist for the U.S. Army Surgeon General, wrote an extensive article on the massive impact of disease on U.S. Forces in WW I (mostly the 1918 flu pandemic) in a 2010 "Public Health Report" article entitled "The U.S. Military and the Influenza Pandemic of 1918-1919" (see: https://www.ncbi.nlm.nih.gov/pmc/articles/PMC2862337/ ). Whether one died in combat action or by infectious disease in WW I, these sobering statistics remind us of the sacrifice and losses experienced by both troops and their loved ones at home, as both combat and disease took so many lives in WW I. The bit about disease caught my eye as well.